A brief synopsis – Due to Jan’s spending and lack of job prospects, Michael is in a money crunch. He has sold one of the cars and picked up a second job. It is beginning to affect his managerial duties. Kelly and Darryl are moving forward with their relationship. Jim and Pam spend their first night out together…at Schrute Farms. Dwight is in abject misery without Angela, as Andy makes his move for Angela. Darryl: Hey, I like you. Oh yeah, what’s not to like? But you need to access your uncrazy side, otherwise maybe this thing’s run its course. Darryl: Slow down, think it over. Darryl Philben is the most complicated man that I’ve ever met. I mean, who says exactly what they’re thinking? What kind of game is that? The best moment – Pam hears a slamming noise in the middle of the night at Schrute Farms, looks out the window and sees Mose hanging out in the outhouse. 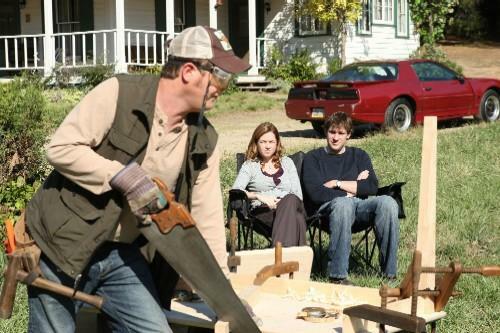 2nd Best Moment – Mose racing Jim and Pam’s car down the road to Schrute Farms. The best storyline – Michael trying to hold onto his dignity the old-fashioned way: by working. Would Michael have been reprimanded? – He’s threatened here, but I really don’t think it would happen for taking a second job. This is one of the best performances that Michael has had in his tenure on the show. Sure there are ridiculous moments, like when he tries to catch the train or declares bankruptcy. Dwight plays his misery expertly, with his flute rendition of Bon Jovi. Jim and Pam do a great job showing more than just an ability to make fun of Dwight, which adds to the depth of the show. Kelly in any capacity is wonderful, so seeing her with another great character like Darryl is a win. Andy’s attempts at wooing are so endearing.